How do you say brunch in Italian? Italy doesn’t have much of a brunching culture. It’s kind of hard to work it in when lunch starts around 11:30 and lasts right through to after-dinner drinks. So when the team at Fabbrica (our flagship Italian restaurant) decided to start working on a brunch menu, they got a chance to step outside their wheelhouse a bit. The lemon ricotta pancakes promise to be a top seller – the citrus flavours mixed with preserved blueberry alone is worth the trip to Don Mills and Lawrence. A few other hopefuls for us are the eggs benny (its not brunch without the Ben) and the Eggs all’ Inforno, aka Eggs in Hell. The Calabrian chili is a small homage to the old country, with a pretty sizable kick. The Sloppy Giuseppe made the cut, of course; and rightfully so. It’s poached egg, caramelized onion, Fabbrica meatballs and potato on a toasted focaccia; and perfect for soaking up the party from the night before. Speaking of parties, no brunch is complete without cocktails and our in-house mixologist had a lot of fun pairing libations with the menu. There’s a bacon and egg Caesar already gaining a reputation. The glass is rimmed with bacon for a different kind of salt, and the ingredients are pickled in-house, including the quail eggs. There’s also a Bloody Maria (yup, we went there) featuring local peppers from Bumpercrop, pickled in Ontario cider vinegar and spiked Oakville’s Cameron’s Auburn Ale. But the signature cocktail is a barrel-aged negroni. It’s aged using the Antica Formula Carpano vermouth — the very best in our opinion — and done right by the bar where everyone can see it. The orange ice sphere that comes with the negroni is a perfect touch, but don’t take our word for it. Book yourself a table and come see what authentic Italian brunching feels like; you know…if they did that sort of thing. Watch our bartender, Bradley Pacheco prepare the Bloody Maria. Mark McEwan is a brand. But before that he was just a guy in a kitchen. That’s what Moments with Mark is all about – a retrospective look at the paths taken, the lessons learned and the tastes formed. In future MwM entries, we’ll get into the first meal he ever made; the influence his grandmother has had; advice he would give himself and so much more. There’ll be something for everyone, from foodies to entrepreneurs. If you could travel back to 1991, what would you say to yourself? What career might you have had if you weren’t in the food business? Navy fighter pilot or landscape architect. What’s a food or dish you remember loving when you were a kid? My grandmother’s bologna roast & baked beans. How would you classify your temper in the kitchen? Controlled. Quick to get anxious, but I never scream. If someone isn’t performing well I just replace them. What’s the strangest part of being on TV? People calling me a celebrity. How do you feel about the recent popularity of food trucks? Goose for Christmas dinner. I made juniper sauce with a little cream, a little mustard, and some parsley; and fresh apple-sauce. Is there a type of food or ingredient you can’t stand? What’s your favourite kind of pasta noodle? Linguine, probably. Or pappardelle. Any long, flat noodle that goes well with braised beef or pork. What’s one of the best restaurants in Toronto to take a date? Bestellen. All carnivores in Toronto Western union agent should visit. When you’re dining in New York, do you ever leave room for a classic slice of pizza? I lean more toward steamed hot dogs from street vendors; or a smoked meat sandwich. If you’re in New York and you don’t visit a good deli, you’re wasting your time. What’s your favourite kind of white wine? Cold Italian. Leftover spaghetti & meatballs, or pizza. We’ve dreamed up the ideal foodie gift basket. 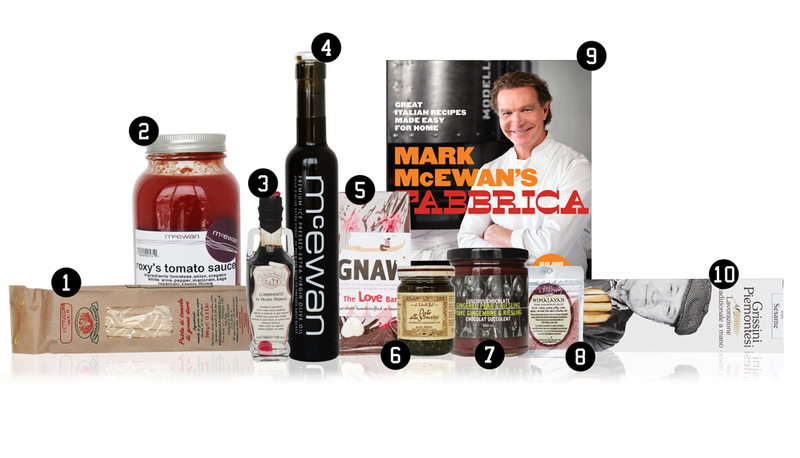 All items have been expertly selected from our gourmet grocery store, McEwan and with the help of the Fabbrica cookbook you are all set to make the perfect Italian meal for your sweetheart. 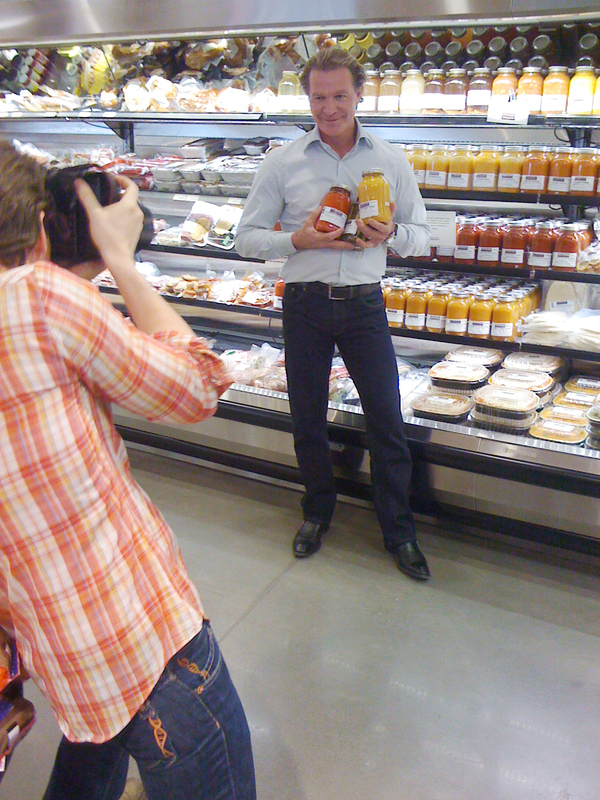 Did you know that Roxy’s Tomato Sauce recipe is from Chef Mark McEwan‘s wife? From our store to your kitchen Happy Valentine’s Day.